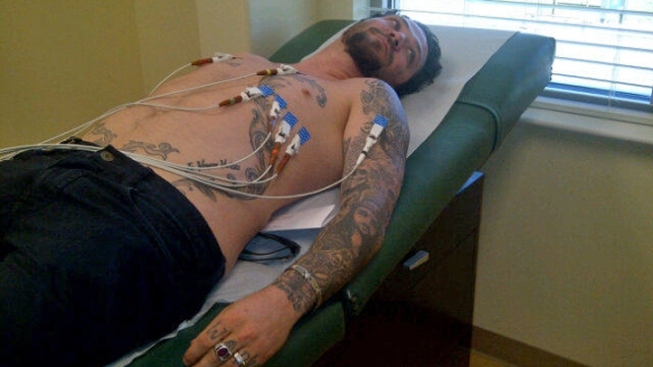 Bam Margera tweeted a photo of himself in the hospital Wednesday. Reality star Bam Margera is tweeting that he has been hospitalized with three broken ribs and possibly more broken bones Wednesday. Margera included a photo of himself in the hospital as proof of the injuries. At about noon, Margera confirmed that he has broken his ribs and possibly other bones. “Just as I thought, 3 broken ribs, still finding out about the elbow,” Margera tweets. Margera told TMZ that he fell down the stairs after racing his neighbor up the stairs and “tackling” him. Margera said that they were just “horsing around” and he promised his neighbor that if he beat him up the stairs he would give him one of his skateboards. Margera has been in the limelight lately after “Jackass” co-star Ryan Dunn and friend Zach Hartwell died in a high-speed car crash after a night at a West Chester bar. It is unknown where Margera injured himself, but he was seen in West Chester Saturday performing in a benefit for Hartwell’s wife Rachel.